This was the first overtly gay-friendly bar that I have visited. I wondered what that big red ribbon in the window was all about. 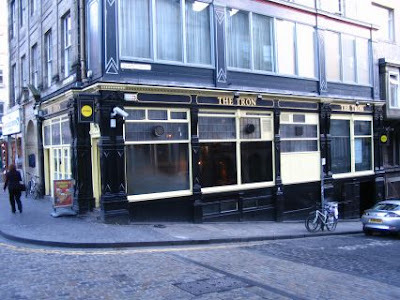 Since then, I have noticed a few other pubs and bars in the designated pink triangle of Edinburgh defined as the area bounded by Broughton (pronounced braw-TUN and not BROW-ton like we do back home) and Leith Walk. The pub itself was okay. 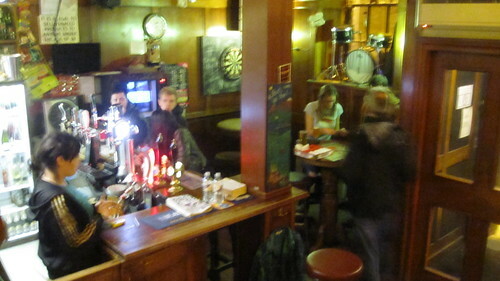 The layout was similar to many basement New Town pubs. 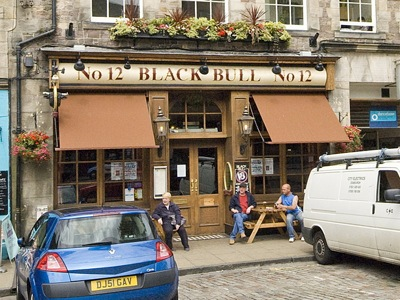 The beer selection was mediocre, but that doesn't seem to dissuade many of Edinburgh's finest bald men from hanging out on the patio. I settled for a McEwans 80/- after it was determined their guest cask was empty. Last call had already been made when I arrived at 9:42 PM, upon whence I was informed that I had 15 to 20 minutes to drink up. So I ordered a half-pint of Harviestoun Bitter & Twisted blond beer, the only real cask ale on tap. 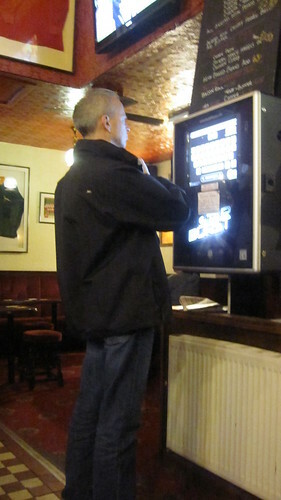 The pub itself was cozy, organic... but dominated by two televisions, and they provided the only soundtrack. They had a decent selection of wine on tap (! ), but not too much in the beer department. It is closed for refurbishment! Too bad, because I was excited to check it out given how close to home it is. Hopefully it will reopen soon and be awesome. UPDATE: It is now a property management company. Black roses are symbols of Irish nationalism and anarchy. 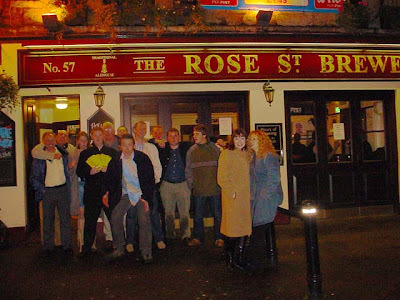 The Black Rose pub seemed to lean more towards the latter, with a smattering of goth metal and a side dish of Hallowe'en. If you don't believe me, here's photo evidence. They did play Lullaby by The Cure, which is always nice to hear and was well-timed given the discussion Meghan and I were having regarding the merits of male vocalists. There wasn't much of a beer selection on tap, so I settled for a Deuchars. Meghan had a Strongbow. Quel surprise. 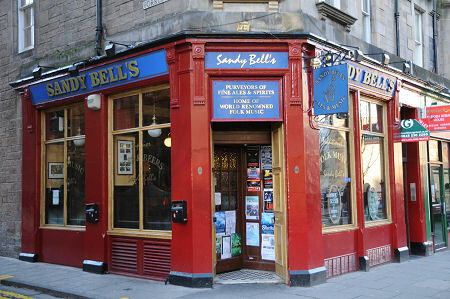 A pub that fancies itself as a bit of a big deal in the local folk music scene, Sandy Bell's felt like an Irish pub. There was a small group of fiddlers sitting at a table in the back, playing traditional Irish folk tunes. 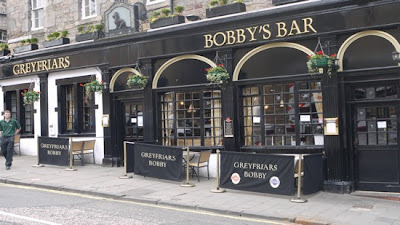 I suspected the bartender was from Ireland rather than Scotland, as her slight frame, short black hair, and blue eyes reminded me more of Sinead O'Connor and less of Kelly Ellard. Indeed, she confirmed she was from the west coast of Ireland, just north of Kerry. I drank an Ossian Pale Ale from the Inveralmond Brewery in Perth, Scotland. Here's a picture of the aforementioned bartender's head floating above my beer. According to the brewery website, Ossian, Son of Fingal, was a legendary warrior from the 3rd century. His grave stone can be seen north west of Perth in the 'Sma Glen', of which Sir Walter Scott wrote.... "In this still glen, remote from men, Sleeps Ossian, in the narrow glen". It was okay. I followed it up with a Guinness. 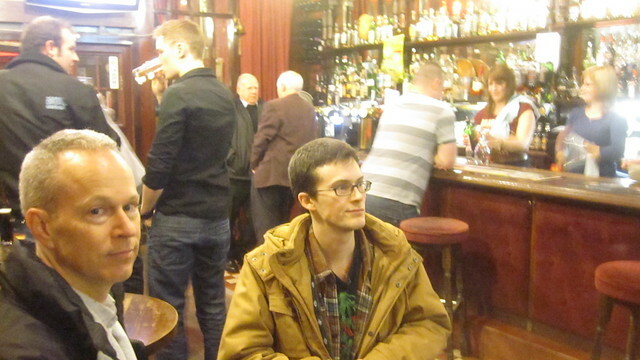 ...on this evening it was certainly the most crowded pub in Edinburgh. 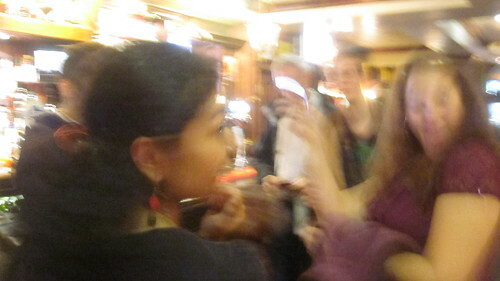 Here is Toby explaining the Eurozone debt crisis to Meghan. Guy Fawkes Day in Edinburgh! The sister pub of the Guildford Arms, the Abbotsford has a super cosy interior, friendly atmosphere, and an island bar that fills the center of a rectangular room. We were thinking how awesome it would be if this pub were at Haultain Corners back home. We were also wondering who even knows how to make these elaborate bars any more, with tons of wood-turned detail. Here we are at the end of the bar. Check out the Guinness drinker next to us. I should cross-post this pic to Look at this F*cking Hipster. The pub featured a nice lineup of Fyne Ales, including Avalanche. Chris the bartender (pictured here), wins the award for friendliest person from Edinburgh. Hands down. He actually talked to us and asked us questions, and didn't just try to avoid making eye contact with us like so many of the people who live and work here. He talked with us about Hibs Football, local beer, traveling, other pubs, my blog, how he was hired for his smile, how if you drink here as a regular you get your own coaster... anything. 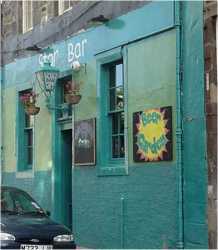 All the while I enjoyed quite a nice beer by the name of Misty Law by Kelburn Brewery. Linus had his first Caledonian 80, which he quite enjoyed. Here's a funny picture I found on the Interwebs of the outside of the pub. A great first visit to the Rose Street Brewery, and definitely will not be our last.